I’m guessing if you’re from the South, you’ve had a slice of Chess Pie. Or you’ve at least heard of Chess Pie. I, however, am from the northern realms of the Midwest, and hadn’t heard of or experienced its wonderfulness until just a couple weeks ago on my first visit to Louisville, Kentucky. A trip to a new place just wouldn’t be a complete success for me without some fond food memories. And while there were actually several to choose from on this trip, it’s the Chess Pie that got to me the most. Maybe it was the fantastic group of people I was sitting with, or actually sharing a piece with the very lovely Sandy, or the soft warm air of a late evening patio…whatever the reason, I was charmed by this southern dessert and knew I needed to recreate it when I got home. I found that Chess Pie was originally brought over from England. Recipes can vary, but generally have a single pastry crust with a filling composed of eggs, butter, granulated and brown sugars, and vanilla, which yields a custard-like pie. But unlike other custard pies, Chess Pie includes a bit of corn meal. My version – Chess Pie Bars with Dark Chocolate – is in bar form (the essential dessert when you’re in the Midwest!) 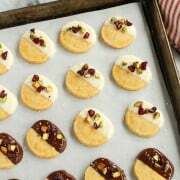 and utilizes an easy pressed-in shortbread crust. The texture and flavor of the filling lies somewhere between a custard pie and a pecan pie. And I included chunks of dark chocolate, just like I enjoyed it in Louisville. 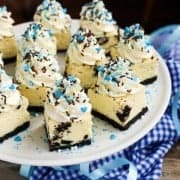 These bars are easy to make, taste ridiculously good, and they’re helping to keep Louisville alive in my Minnesota kitchen. Preheat oven to 325°. Spray a 9″ square pan with nonstick cooking spray. Combine the flour, sugar, and salt in a medium bowl. With a pastry blender, cut in the butter until crumbly. Then quickly mix with hands until it forms a dough. Don’t worry if it seems a bit dry. Press dough evenly onto the bottom of prepared pan. Bake for 10 minutes. Remove to cooling rack while preparing the filling. Stir together brown sugar, sugar, cornmeal, flour, and salt. Add butter, cream, vinegar, and vanilla. Mix well. Then add the eggs and stir well to combine. Fold in the chocolate pieces and then pour mixture into pre-baked crust. Bake for 50 minutes, or until the filling is browned and set. Cool completely on a wire rack. To expedite the chocolate setting up in the bars, you can place the pan in the refrigerator for awhile before cutting. Inspired by a delicious piece of Chess Pie from a visit to Louisville, KY. Recipe heavily adapted from Southern Living (March 2000). And now, more about my trip to Louisville with GE Monogram! 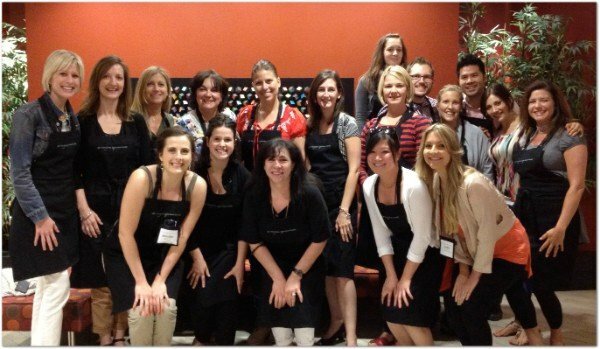 Here we are – the very first group of food bloggers invited to the GE Monogram Experience Center…what a fun and talented bunch to spend a few food-filled days with! Our accommodations at The Brown Hotel were absolutely lovely. I appreciate the preservation of history, and loved seeing The Brown’s years being taken care of so well. 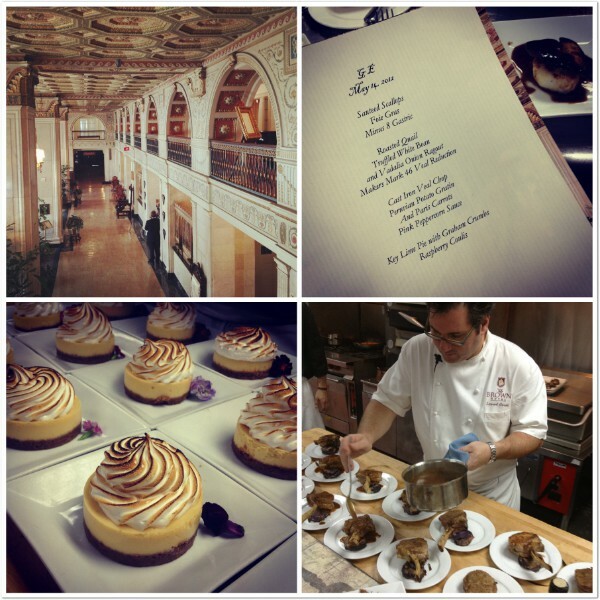 Our group was treated to dinner with their Executive Chef…right in the hotel’s kitchen! It was a very special (and scrumptious!) meal that kicked off our time in Louisville together. We spent the majority of our time at the beautiful GE Monogram Experience Center, in the GE Appliance Park. It was clearly evident that GE is proud of its history, and that they are way more than just light bulbs and appliances. Established in 1953 and dubbed “a city within a city”, this place is large enough (approximately 900 acres) to boast its own zip code! We learned about many of GE Monogram’s products, but what stood out most to me was the induction cooktop (above, left). Since my husband and I switched out our electric stove for a gas one about 5 years ago, I had forever sworn off anything but gas. But…I have to say the GE Monogram Induction Cooktop made me think twice. 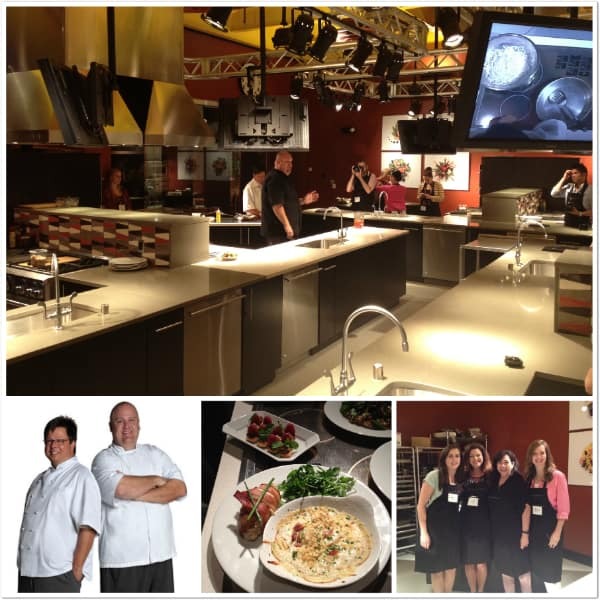 By demonstration and our own use in the kitchens, we saw firsthand the power of this cooktop. It was extremely responsive, heating up and cooling down super quickly. I also liked that it was easy to clean up and didn’t create heat in the kitchen. We cooked in this oven and I was amazed at the quality of food that came out of it, in a much shorter than normal amount of time. We had the honor of playing (cooking) in GE Monogram’s state-of-the-art kitchens, home to Chef Joe Castro and Chef Brian Logsdon. We cooked several meals, all using the induction cooktop, the Advantium oven, and the extremely envious GE Monogram Dual Fuel Professional Range. Ohhhhh…the fun I could have with that baby in my kitchen! Our time there culminated with an Iron Chef competition, where our cooking expertise was set against the clock. Although my team didn’t win, we surely enjoyed the goodness of our 50 minutes of labor when we all sat down to enjoy our final meal together. GE Monogram made sure to get us out and about to experience some local culture. The highlight for me was visiting Bourbon Barrel Foods, producer of gourmet sauces and seasonings. I fell for many of the bourbon smoked products we tasted and took home my own little stash to experiment with. 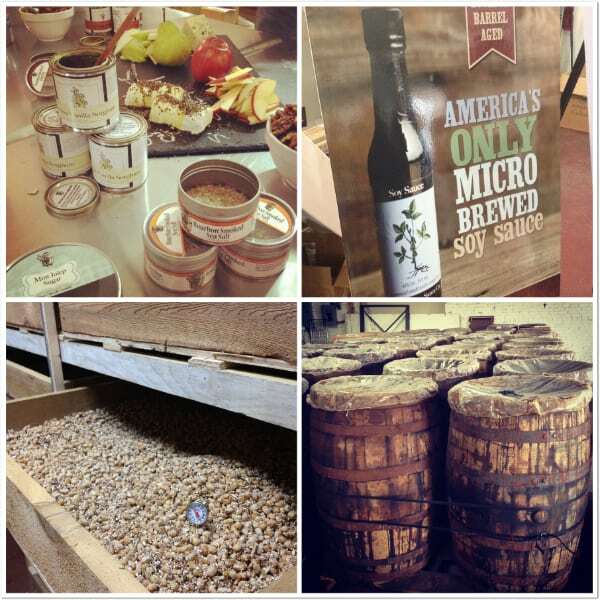 Bourbon Barrel Foods is also proud to be the only soy sauce micro brewery in the United States. We were taken through the soy sauce process, and were able to see the fermenting soy beans, and then the soy bean mash aging in re-purposed bourbon barrels. The passion behind this company was strong. I left feeling inspired. And hungry for deep rich soy sauce drizzled over everything in sight! I arrived in Louisville a few hours before many of the other bloggers and took advantage of that time to power walk this new-to-me city. 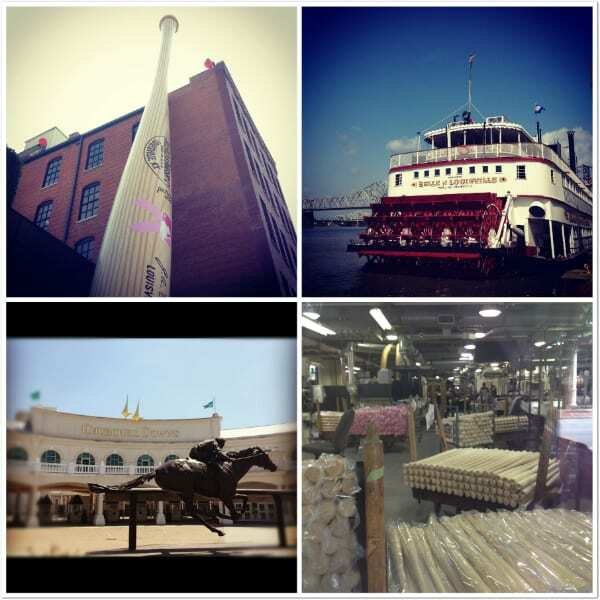 I spent some time on the Riverwalk along the Ohio River, and then headed to the Louisville Slugger Museum & Factory, where I witnessed those famous bats being made. And then, before we caught our flights back home, our group made a stop at Churchill Downs. I’ve always known of the deep pride of history and tradition of Kentucky horse racing, but it really was something awesome to actually walk through Churchill Downs. Thank you so much to GE Monogram, who paid for my entire trip and provided me with an incredible and memorable experience. All text and opinions are my own. Can I simply say that of a relief to uncover one who actually knows what they’re speaking about over the internet. You certainly know how to bring a concern to light to make it essential. Lots more people should check out this and can see this side from the story. I cant think you’re not more well-known since you also absolutely develop the gift. looks like you guys all had a lot of fun! I’ve never heard of chess pie bars either! 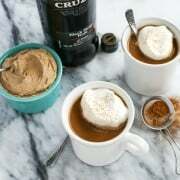 :) But i bet it’s super yummy if i were to try it! I wish I could have gone on the trip. Looks like you had fun! Hopefully we can meet up another time! I wish it could have worked into your schedule, too! Someday!!! Have a great week, Maria. 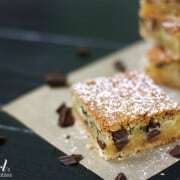 your chess pie bars look amazing! i LOVE the idea with dark chocolate. YUM! Thank you, Kellie – it was a great trip, and so fun to connect with people in real life. And now I have a great new recipe to remember it all by! Thanks for saving some of these moist and delicious bars for your Dad and I over the weekend. I think your version looks even better than the one we had in KY! Yum yum! I do have to say that’s it’s pretty darn good! But the company I was keeping in KY while eating it will always be this recipe’s greatest memory…such a great trip. It was so lovely to meet you, Jenn! Looks like such a FUN trip. It makes me want to become a food blogger so I can have such a fun opportunity (thinking I missed my chance on that, being an ’empty-nester’ now). Anyhow, I learned to make chess pie from my grandmother, but hers didn’t use cornmeal and could be made with or without evaporated milk (which really made it custard-y). I had to make one every Thanksgiving while my own children were growing up! Definitely a southern staple! Hi Cindy! So interesting to hear that your grandmother’s recipe doesn’t use cornmeal. I love hearing about everyone’s traditions – thanks for chiming in! What a lovely trip and wonderful experience you had! Thanks for sharing some of it with us. My sister-in-law has an induction cook top and absolutely loves it! 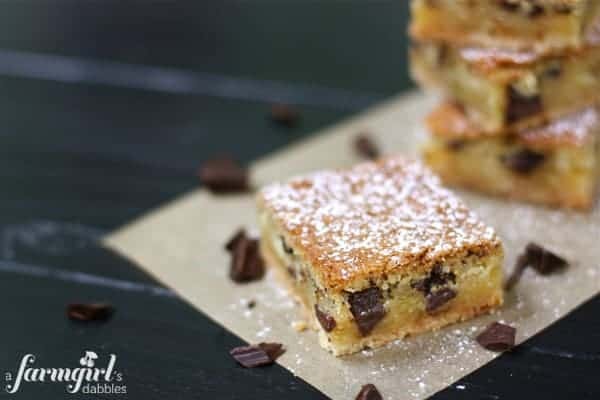 I am a big fan of pecans and of shortbread so this chess pie bars certainly look like something I would enjoy very much. Sounds like I have been missing out. I will have to give your bars a go Brenda, they look very good! Thanks for sharing. What a fun trip! It’s always great to see you too! Great post!!! What a fun post! I love all your pictures. Wow, that looks like a fun and exciting trip! I’ve been to the south, but never Kentucky. I would love to go one day (I love the south so much)! Wow, awesome trip!! I have never been to Kentucky but have the goal of seeing the Kentucky Derby one day. Your chess pie looks fabulous. I’m a west-coaster but food from the south is always very appealing to me. YUM! Thank you, Julia. I hadn’t ever really thought about actually going to the Derby…until I walked around Churchill Downs. I want to see a Derby now, too! I have spent time every summer in North Carolina since I was a wee child, so you think I would have tasted chess pie by now. However I have not! Sounds like I have been missing out. I will have to give your bars a go Brenda, they look very good! Those bars look spectacular – what a great idea. It was lovely meeting you in Louisville! Thanks, Sarah – so lovely to meet you, too! Have a great week! Loved meeting you and sharing this wonderful experience with you! Especially the giggles! What a great event, I loved following along on Instagram! And Chess pie has to be one of my favorites, love the gooeyness! Hi Cassie! Do you make Chess Pie yourself? I’d love to know the recipe you use! I haven’t, I’ve only eaten it. I have made the Milk Bar Bakery’s version called crack pie and it is outstanding! I also make buttermilk pie, which from what I can tell, is very similar to chess pie. Sounds like a great trip! Did you learn to say Louisville like the locals? It amazes/dissapoints me every year watching the Kentucky Derby (other times too, but the Derby in particular), at how many newscasters don’t bother to learn how to say it right (Luavull is probably how I’d spell the pronunciation). I lived in Lexington for 3 years & learned many new/creative ways to say words like the locals. KY is a beautiful state full of wonderful people – southern hospitality is an amazing/real thing! I practiced up before I went! ;) I got a kick out of the souvenir t-shirts that tried to sound out the pronunciation. Nice to hear from you, Amy! What an exciting trip..I like that you posted pictures.. I have never had Chess Pie either. We will try it when my son comes home on leave.. (I’m so excited). Nice to hear from you, Jan – I hope you like these bars, too! The cheese pie looks really yummy!! I’m in CA so I’ve never tried (or seen!) Chess Pie, but I love a good dessert bar so I’m sure I’d like these (especially since chocolate is involved! ;)). Well I’m glad to know I wasn’t the only one…seems like many people had heard of it! This definitely went over very well at our house – we’ll be making these again! Thanks, Laura!